Finally I have a new bread recipe for you! A very strong, dark, rugged and delicious one! The main ingredient is teff, a special millet from Ethiopia. The teff flour, which is gluten free, is available in most health food stores. For example, from the brand Bauckhof. 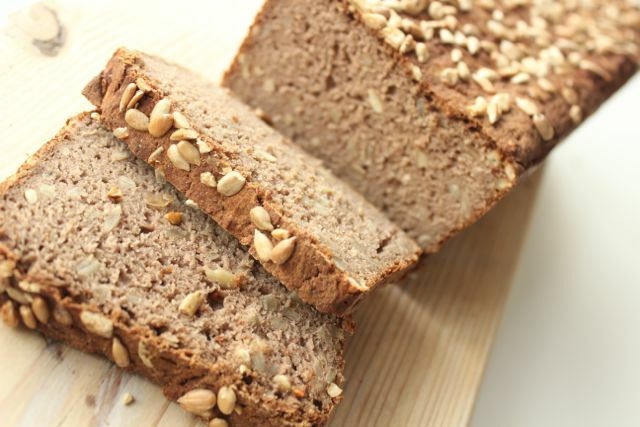 Mixed with buckwheat and chestnut flour it forms a really nice, savory dark bread with its own distinctive flavor. First, dissolve the yeast with the agave syrup in some warm water and leave to rise for about 5 minutes. Then add yeast mixture, oil and water to the dry ingredients and knead carefully (by hand or with a mixer). Fill dough into a loaf pan and allow to rise another 40 minutes at 50 °C in the oven (covered with a tea towel). Then remove from the oven, spread the dough with water and sprinkle sunflower seeds on it. Heat up the oven to 230 °C (top / bottom heat) and place a cup of water in the oven. Bake the bread for 10 minutes at 230°C, then turn down the temperature to 200 °C and bake for another 50 minutes. Remove the bread, let it cool and enjoy! Have fun-baking and bon appetit!